Inside Stories: IS CHARACTER DESTINY? Is character destiny? Hell if I know! But one's character would seem to have a bearing on things, especially if we are to judge by "Historia Semanal de Amor y Pasion" ("Weekly Story of Love and Passion"), a very soapy little Spanish-language comic book that I love so much I sometimes spend an hour on the subway just to get the latest issue. The issues contain free-standing (i.e. not serialized) stories, many of which take place over the course of years, even a whole lifetime. Maybe if you compress a few years of anyone's life into a 150-page pocket-size comic book, it will seem eventful, but the lives here are especially dramatic. One of my very favorites -- gosh, I feel just a touch guilty playing favorites, there are so many good ones -- is called "Sacrifice for Love," and it's about a young woman named Isadora who, upon turning 18, goes out and gets drunk with her betrothed and figures now would be a good time to learn to drive. Naturally, there's an accident, the boyfriend is killed but Isadora survives to stew in her own guilt as she recuperates in the hospital. It is there that she is visited by a neighbor who says her stupid behavior effectively killed her (Isadora's) mother. After recovering, Isadora is hauled off to prison for a 15-year-long sentence which starts with vicious fights but gives way to industriousness and acceptance on Isadora's part. And that's just the first third of the story. It's a doozy. 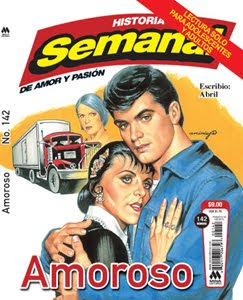 Or how about "Amoroso" (cover picture at left), about a handsome truck driver named Daniel and his helper Bernardo who dream of getting their own truck and starting their own business. Daniel, on his sojourns, occasionally visits various women for romantic trysts, including an apparently delusional and poor elderly woman -- whose relations with Daniel baffle many others, but he's just generous with himself. She dies and leaves Daniel a sum of money she'd been secretly saving, and which allows him to buy his truck. Problem is, he totals it, and, well, ends up learning about generosity. But no heavy-handed morality tales are these, just powerful displays of some of the most basic human emotions. Many of the stories have to do with long-standing patterns people carry from one marriage to the next, or character traits that lead people to self-destruct, not to mention the usual assortment of cheating husbands and long-suffering wives, and actresses and yacht trips and all the great stuff that happens in imaginary lives. So, when reading these, I can't help but reflect on Heraclitus's remark that "character is destiny" -- are we stuck with who we are, or is there some possibility for change? Is a person's life story, like the latest issue of "Historia Semanal," basically written before she has a chance to live it? Of course the idea that "character is destiny" would have been spoken by an ancient Greek philosopher, whose country's tragic plays all hinge on fate. But the trick is, Heraclitus also famously said, "you can't step in the same river twice" -- the river is different, and so is the person stepping into it. What's it gonna be, pal? That human character is ever changing, or unchanging? I have to know so I can decide whether to go for an advance discount on the epitaph on my grave. On a related note, David Brooks had a curious op-ed piece in the New York Times the other day, in which he mused on two views on character -- the philosopher's view that says character is unchanging, and the psychologists' view that says it is situational, or rather that the traits we display and the choices we make may change depending on the setting or who you're talking with. As much as the Historias feature characters who just can't escape their own fundamental traits (at least not until the end of the story! ), there are plenty of others who manage to learn a thing or two -- and in so doing change their character, and, it would follow, their "destiny."